Chair of the Social Accountability Working Group of the College of Family Physicians of Canada, Past President of the College, a family physician providing home-base palliative care in Toronto, Ont, Education Lead at the Temmy Latner Centre for Palliative Care at Mount Sinai Hospital, and Associate Professor in the Department of Family and Community Medicine at the University of Toronto, Member of the Social Accountability Working Group of the College of Family Physicians of Canada. Associate Director of the Rural Coordination Centre of BC, a practising family physician, and Professor in the Department of Family Practice at the University of British Columbia in Vancouver, Member of the Social Accountability Working Group of the College of Family Physicians of Canada. Family physician in Saskatoon, Sask, Head of the Division of Social Accountability at the University of Saskatchewan, and founder of Upstream: Institute for A Healthy Society, Member of the Social Accountability Working Group of the College of Family Physicians of Canada. Family physician with the Inner City Health Associates in Toronto, Co-chair of the Ontario College of Family Physicians’ Poverty and Health Committee, and Lecturer at the University of Toronto, Member of the Social Accountability Working Group of the College of Family Physicians of Canada. Screening for poverty.2,3 Providing health care to uninsured migrants.4 Advocating for a national pharmacare program.5 These are but 3 examples of how family physicians are currently actualizing social accountability in Canada at the individual (micro), community (meso), and system (macro) levels. As family physicians, the essence of social accountability rests in responding to the health needs of our society with whatever capacity we have and in whatever ways we can. In the case of family physicians and their organizations, this accountability encompasses the actions taken within the primary care setting in individual doctor-patient relationships (micro), the collective interactions of physicians and organizations with the communities they serve (meso), and the interactions of societies with their professions (macro). This article is the first in a series of 4 that explores how social accountability can be put into action at each of these 3 levels. This is a call to action and a raising of awareness of our responsibility to our patients, communities, and society as a whole. Building upon the framework and recommendations released in the Best Advice Guide: Social Determinants of Health,8 this series further explores how to get involved to realize our social accountability mandate. It describes the core activities and the obligation of every family physician and family medicine organization to fulfil our social contract with the patients and populations we serve. Medicine has a long tradition of defining and calling its practitioners to develop and attend to the doctor-patient relationship. The essence of family medicine is this relationship that lives between doctor and patient, extending across life’s stages, including events of both illness and health, while attending to all the things that influence health. This is qualitatively different than other medical specialties that focus on particular diseases or technical skills. While the doctor-patient relationship has been diminished by an increasingly fragmented health system and subspecialization leading to episodic and technical care, family medicine cannot escape the fact that it is relationship-based care that endures over time and place. Further, because family physicians are community-based and take the constant view of both illness management and prevention, we are obligated to contextualize our care with the knowledge of what makes our patients healthy or not. Each level of this continuum influences every other level. Through our enduring relationships, we can learn to map the connections upon which we might have some influence. A cardinal value of social accountability is social justice. 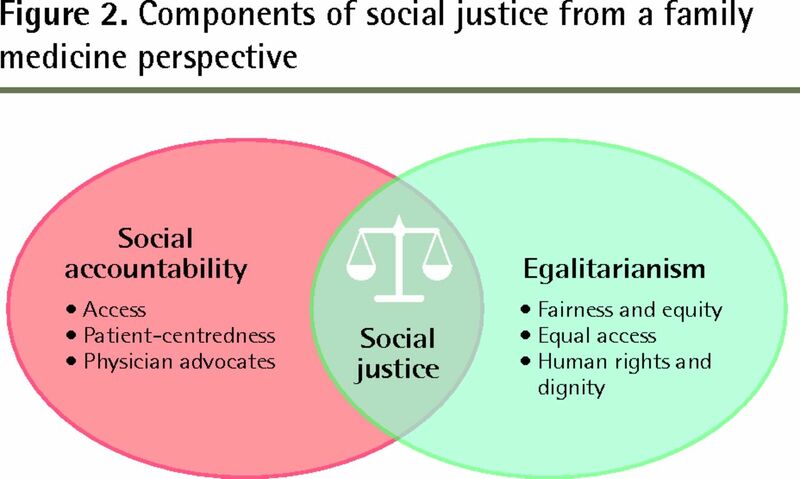 Social justice plays a strong role in shaping how we consider health inequities within populations and how to target interventions toward specific health issues (Figure 2). The College of Family Physicians of Canada recently released a Social Justice Lens13 tool to evaluate the characteristics of its own activities—as well as the activities of other actors and organizations at the meso level. This is a modern-day expression of a historic call to social justice by members of the profession going back as far as Hippocrates and Ibn Sina. Virchow leads us into the meso and macro levels of our social accountability. This concept of social accountability bridges our 4 principles, grounded in serving individual patients, with our obligations to look “upstream” and to influence the social determinants that contribute to our patients’ illness and disease. At the individual patient level (micro), emphasis will be placed on the importance of a relevant social history, including the use of tools like the poverty screening tool.2,3 It will illustrate how the SDOH affect a patient’s ability to follow through on treatment recommendations, raise awareness of how to have flexibility for those with special needs (eg, mental illness, addictions, or homelessness), and demonstrate how to access the kind of social supports our patients need in order to improve their health. At the community level (meso), we will learn that family physicians should collectively establish systems of practice that meet the health care needs of people in our particular communities. For example, in rural or small-town Canada, practising as a true generalist is a socially accountable way to ensure that people receive the right care, at the right time, and in the right place. Communities of varying sizes and with variable demographic profiles and needs require groups of physicians who collectively adapt to meet those needs. Services that might be supplied by high-volume non–family physician specialists (surgeons, interventional obstetricians, anesthetists, etc) in densely populated cities might quite appropriately be provided by generalist practitioners in the rural setting with focused skills that allow the safe delivery of such needed services—safer and healthier than would be the case in their absence. As we strive toward the interprofessional Patient’s Medical Home,15 the demographic characteristics of a population would determine the kind of health professionals that should be available to meet the population’s specific needs. One clear implication of this is that our educational and health systems must produce the optimal number of physicians and other health care providers, as well as achieve the appropriate ratio of family physician generalists to other specialists. Meso-level social accountability in family medicine is about the convergence of primary care with public and population health. Leadership, advocacy, and planning for particular services that are needed in the community are the essence of social accountability at the meso level. Finally, we will discover that macro-level social accountability is about connecting politics to public policy, bringing to the fore that unique, trusted voice of physicians and recognizing the power of physician advocacy. The physician role in bringing about health equity in Canada will be described and ideas about how physician organizations can participate to address the SDOH to allow for more “upstream” effects and care will be provided. That physicians bear daily witness to ill health gives us the perspective, credibility, and necessity to engage in advocacy at this societal level. The history of medicine in the 20th century could be described as an uncritical and unrequited love affair with specialization and technology. This has led to the unfortunate separation of personal and population health, and of health professional schools and schools of public health. Balancing the wisdom needed to use technology appropriately with meeting individual and population health needs is in the realm of true generalism. This represents the core of what socially accountable family practice must offer society in the 21st century. Helping family physicians individually and as a discipline find our niche in the continuum of socially accountable practice is the objective of this series. Understanding and meeting the obligations of our social contract with our patients at all levels can reconnect many of us to the reasons we chose family medicine as a career in the first place. The pursuit of better health for our patients and a more just society are conjoint features of the future we can and must build together as individuals and as a discipline. Diana is a 40-year-old woman living in a small rural northern community. You recently diagnosed her with cancer of the cervix after she presented with persistent vaginal bleeding and odour. She had not had a Papanicolaou test in more than 10 years. She would rarely come in for her personal health care needs, which included type 2 diabetes mellitus, hypertension, and chronic kidney disease. However, you knew her to always be diligent in looking after her children’s health care needs, including ensuring they received all their vaccinations and medication for asthma, which both children have. She is a single mother raising 2 children, a boy (aged 12) and girl (aged 10), without any form of community support. Upon inquiring, you recently learned that she was only able to attend school until the sixth grade and is functionally illiterate. She has always struggled to make ends meet and periodically worked in precarious jobs in the service industry, including waiting on tables, motel housekeeping, and serving at fast-food counters. As the sole caregiver and breadwinner, Diana is very concerned about what this diagnosis will mean for her and her family. Follow Diana’s story through this series of articles to learn how socially accountable care at the individual, community, and societal levels can improve the care that patients like Diana receive, as well as ultimately prevent the conditions that have already led to so much personal suffering. Cet article se trouve aussi en français à la page 24.
. Pathologies of power. Health, human rights, and the new war on the poor. Oakland, CA: University of California Press; 2004.
. Screening for poverty in family practice. Can Fam Physician 2012;58:709. (Eng), 710 (Fr).
. Development of a tool to identify poverty in a family practice setting: a pilot study. Int J Family Med 2011;2011:812182. Epub 2011 May 26. Erratum in: Int J Family Med 2015;2015:4181250.
. Doctor provides health care for the uninsured. The Globe and Mail 2014 Dec 26. Available from: www.theglobeandmail.com/report-on-business/careers/careers-leadership/doctor-provides-health-care-forthe-uninsured/article22214050. Accessed 2015 Sep 21.
. Rx: national pharmacare. Toronto, ON: Canadian Doctors for Medicare; 2013. Available from: www.canadiandoctorsformedicare.ca/images/2013-07-21_CoF_Pharma_.pdf. Accessed 2015 Sep 21.
. The physician as health advocate: translating the quest for social responsibility into medical education and practice. Acad Med 2011;86(9):1108-13.
. Defining and measuring social accountability of medical schools. Geneva, Switz: World Health Organization; 1995.
. Best advice guide: social determinants of health. Mississauga, ON: College of Family Physicians of Canada; 2015. Available from: http://patientsmedicalhome.ca/resources/best-advice-guide-social-determinants-health. 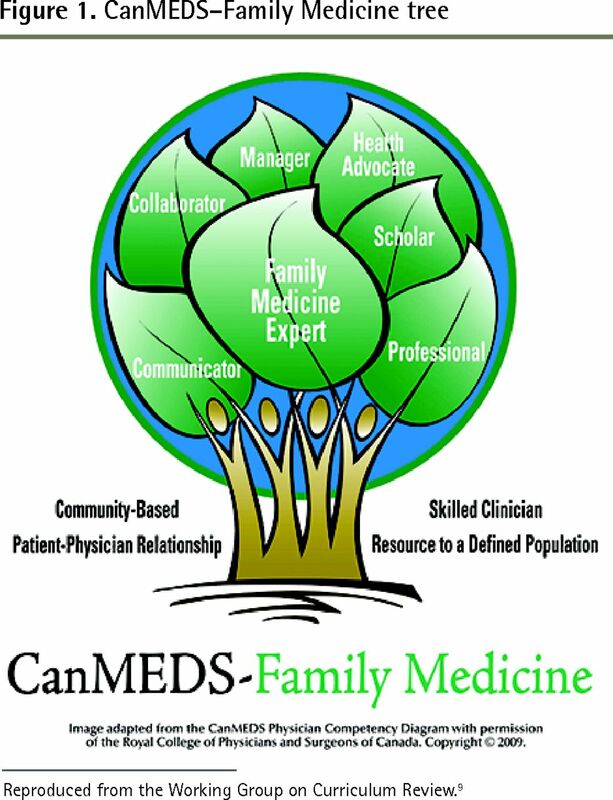 Accessed 2015 Oct 29.
. CanMEDS–Family Medicine. 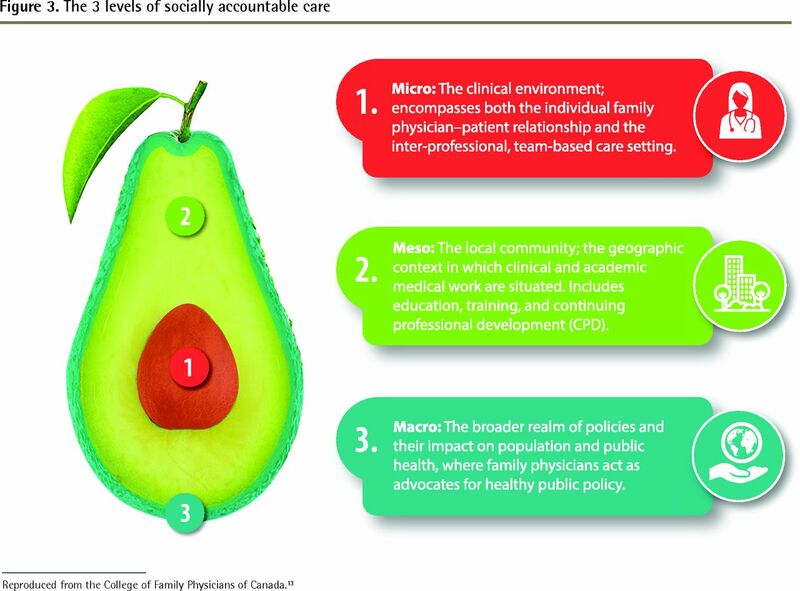 Mississauga, ON: College of Family Physicians of Canada; 2009.
. Social accountability. At the heart of family medicine. Can Fam Physician 2013;59:335-6. (Eng), 344–5 (Fr).
. Social determinants of health. The Canadian facts. Toronto, ON: York University School of Health Policy and Management; 2010. Available from: www.thecanadianfacts.org. Accessed 2015 Oct 4.
. Cultural competency handbook. Toronto, ON: Department of Public Health Sciences, University of Toronto; 1997.
. The CFPC Social Justice Lens. Mississauga, ON: College of Family Physicians of Canada; 2015. Available from: www.cfpc.ca/uploadedFiles/Health_Policy/_PDFs/SJ_Lens_Final_Print.pdf. Accessed 2015 Oct 14.
. Medicine and human welfare. New Haven, CT: Yale University Press; 1941.
. What is ... the Patient’s Medical Home? Mississauga, ON: College of Family Physicians of Canada; 2015. Available from: www.cfpc.ca/What_is_PMH. Accessed 2015 Oct 11. A quoi une revue medicale sert-elle? What is a medical journal good for?